La Famiglia Giorgio’s Ristorante at Half Off via Groupon! 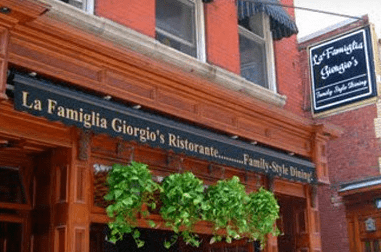 Groupon is offering a great deal at La Famiglia Giorgio’s Ristorante in the North End. You can grab a $40 certificate for two for just $20 or $80 for Four for $35 on Groupon.com. Please make sure you read the terms before you buy, and that you will eat in the North End before it expires in April of 2013. You do have to wait until tomorrow to use it and need reservations beforehand, so keep that in mind. But overall, a very good deal if you love La Famiglia Giorgio’s or have been wanting to go! *Please note that I am an affiliate of Groupon, please read my disclosure policy here.